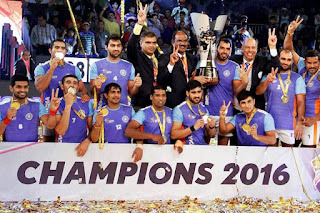 A brilliant second half performance saw India stage a memorable comeback as they beat Iran 38-29 in the title clash to lift the 2016 Kabaddi World Cup in Ahmedabad on 22nd October. In a match contested between two titans of the sport, India beat a resolute Iran side to become the world champions. Riding on a terrific performance by Ajay Thakur's 12 points, India produced a strong comeback in the second half at the TransStadia Arena to send the packed crowd into raptures. The final was like a boxing bout as both teams traded punches and gave it as good as they got.